Here are the names of some common animals in Japanese. Do you know what animals they are? Take this easy, multiple-choice quiz. After you take the quiz, leave a comment on this post to tell me how you did. Also, tell me what you thought of the quiz (Too easy? Too difficult? ), and how you knew the answers that you got right (Lucky guess? You study Japanese?). One week in August, Ueno Zoo in Tokyo has a “Night Zoo” event. We went to it yesterday. We’ve been to it before too (click here to see my post about it in 2011). An 「駅弁」 (Train station “bento”) shop. Have you ever had a Japanese “bento”? You can watch them preparing the bento meals. The 「銀の鈴」 (“Silver Bell”) in Tokyo Station…a popular meeting spot. The one on the left says 「有休とります」 (“I’m gonna take a holiday”) to give your boss or co-workers. The other says 「ごめんね」 (“I’m sorry”) to give someone as an apology. The less-photographed entrance of 東京駅 (Tokyo Station). The popular Japanese cartoon character “Doraemon” in the small children’s mini-amusement park outside Ueno Zoo. I have many memories of taking my kids to this 「こども遊園地」 (Kids’ Amusement Park) when they were little. The entrance to Ueno Zoo in Tokyo. We went to the zoo in the afternoon and stayed until the end of the “Night Zoo” event. We could see the pandas eating, rather than sleeping – as they usually are. シンシン (メス) … (“Shin-Shin” the female panda). リーリー (オス) …. (“Ri-Ri” the male panda). The polar bear was a highlight for us because it was feeding time when we happened to go to that exhibit…and also, Ueno Zoo has added a new viewing area where we could watch him swim! The sun was setting and “Night Zoo” began. A zoo in Ibaraki Prefecture has taken the catwalk to a wild new level, using some of its fiercest inhabitants to rip and claw jeans to a fashionably distressed look. The facility in Kamine has unveiled “Zoo Jeans”, styled by the fangs and claws of lions, tigers and bears. Zoo officials said the material held up well, all things considered. “We wrapped several pieces of denim around tires and other toys. Once they were thrown into the enclosures, the animals jumped on them,” said zoo director Nobutaka Namae, adding that the pieces were later patched together to create the finished product. The idea came from a Tokyo advertising executive who wanted to give something back to the zoo where he spent time as a child, Namae added. Two pairs of jeans ripped by lions and a tiger-destroyed version are being auctioned on the Internet with proceeds to be donated to the zoo and the conservation group WWF. As of Monday, bidding on the tiger-torn denim had soared to ¥121,000 (about US$1,191). They will be on exhibit at the Kamine Zoo—along with a bear-savaged version—until next week. 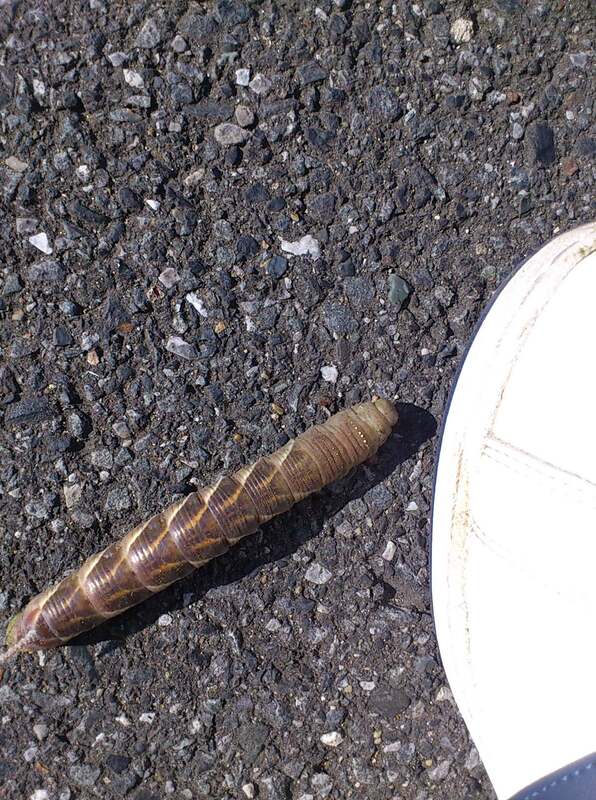 Look at the giant caterpillar that I saw this morning! We were lucky enough to see this 蝉 (cicada) shedding it’s molt near our house!